Knitting & Crocheting Are Hot! Julia Roberts does it, so does Vanna White, Cameron Diaz, Sarah Jessica Parker, Daryl Hannah, Hilary Swank, Julianna Margulies and many others. Knitting or crochet is one of their favorite hobbies, but these crafts aren’t just for celebrities. 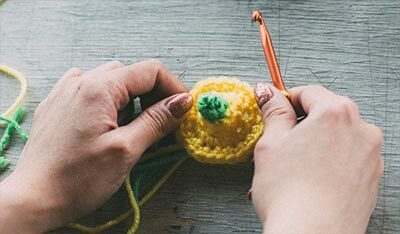 Learn why 20 and 30 year olds are turning on to crocheting and knitting, joining the 38 million consumers who enjoy doing these crafts. send an email thru our contact form. Craft Yarn Council’s 2014 Tracking Study surveyed more than 3,100 crocheters and knitters nationwide about what motivates them to do these crafts, the benefits they derive, plus looks at where they get their inspiration and what they are making. Following is a summary of that study. Since 1994, the Craft Yarn Council (CYC) has commissioned Research Inc. of Atlanta, GA, to gather intelligence on yarn trends about women who have knitted or crocheted a project and purchased yarn during the past year. As in the past, the 2014 survey was completed in October, and for the fifth time it was conducted online. An impressive 3,178 knitters and crocheters across the country participated in the survey. Many of the questions that were asked in previous surveys were included to establish a trend line, and for the first time health and wellness questions were added. The sheer volume of respondents substantiates trends in consumers’ perception of these crafts and their motivation to purchase yarn. All regions of the country were represented. craft. In fact, 84% say they crochet or knit at least 3 to 4 times a week; 58% claim they crochet or knit daily. Fifty-three percent of younger consumers, ages 18–34, crochet or knit daily. Six-in-ten crocheters and knitters made a project for charity last year. At 63%, hats are by far the most popular type of project made for charity, followed by scarves at 35% and baby blankets at 32%. Knitters and crocheters indicated the top three most important reasons they participate in their craft. It was interesting to note differences in responses by age. For instance, 45–54 year olds (70%) and 35–44 year olds (69%) are more likely than younger respondents to say they knit and crochet because it provides them with a creative outlet. For 18–24 year olds, creative outlet ranked fi rst at 57%, followed closely by helping them cope with stress (54%) and making them feel productive (47%). Knit & crochet are good for you! Almost all (90%) knitters and crocheters responded that the craft improves their mood. Similarly, nine-in ten knitters and crocheters claim the craft helps them to relax. Seventy-six percent of respondents who say they have health challenges answered that knit and crochet helps them cope. Of those who have health challenges, 85% say it helps them relax. For 81% it decreases stress and for 57% it decreases anxiety. Seven-in-ten (69%) knitters and crocheters have participated in a knit/crochet group. Our respondents experience the following positive benefits when knitting and crocheting with others. Thirty-seven percent of respondents know a child who knits or crochets. They claim they have noticed a positive influence on children who participate in the craft. Forty-six percent have noticed a sense of accomplishment, 31% more self-confi-dence, 26% perseverance and 24% better concentration. When searching for project ideas on the Internet, social networking sites (83%) and yarn company websites (77%) are the most popular, followed by magazine and publisher websites (37%), retailer websites (34%), and podcasts and YouTube (26%). The most popular social media sites used for the craft are Ravelry (71%), Facebook (61%), YouTube (52%), Pinterest (40%) and blogs (23%). Crocheters and knitters also get ideas from print sources. Continuing the trend, scarves, hats, baby blankets and afghans topped off the list of favorite projects among all those surveyed. Scarves at 86% and hats at 79% were the favorite projects across all age groups. Fifty-three percent of those who buy yarn on the Internet say the most common reason they purchase online is to locate hard-to-find yarn. Thirty-three percent say it is because of convenience and 30% claim they can find the best prices online. Twenty-three percent buy online to get the quantity they need. The members of the Craft Yarn Council are committed to continuing to inspire these enthusiasts with innovative products and fashion-forward designs both in print and on the web, along with programs to reach and educate new consumers to the fun and beauty of knitting, crocheting and crafting with yarn. Passionate Consumers Pass It On! Gastonia, NC—Knitters and crocheters just can’t keep it to themselves. We know they share a strong passion for their crafts, that’s nothing new. It’s been documented in research conducted by Research Incorporated of Atlanta for the Craft Yarn Council (CYC) since 1994. What’s revealing in the 2011 research released earlier this year is how this enthusiastic group enjoys sharing their passion with others. One in ten (87%) surveyed have taught someone else to knit/crochet, which is up from 80% from the 2010 survey. "In addition, for the first time we asked how many people have you taught," explains Mary Colucci, CYC’s Executive Director. "The mean number was 8.5 people, which is amazing. It’s like having an army of teachers helping us grow the industry." She also noted that while the number of people taught increased with the age of the respondent, and those 65 and over taught an average of 12 people, it was interesting to note that the 18-24 year olds surveyed taught 4.6 people. Colucci also pointed out that in general, the survey results for 2011 were similar to those from the prior year. She said, "While we added some new questions, we focused mostly on adding more detail to questions we’ve asked before to better determine knitters’/crocheters’ preferences." Creativity is, by far, the number one influencing factor that attracts women (28%) to the craft and it’s most important to women in the 18-24 age group (31%). Creativity is followed by "keeping hands busy" at 15%, "making gifts" at 13%, and "stress relief" at 10%. Most respondents, 26%, spend 1–5 hours on their craft per week, 16% spend between 6–9 hours and 18% between 10–19 hours. For 49% of respondents, part of their time is spent making charitable items. On average, they participated in knit/crochet charities on 5.5 occasions in 2011. As you might expect, older adults have more time to spend on charitable work but it&rsquos important to 35% of younger knitters/crocheters 18–34 years old as well. Where did you find that project? The Internet is still the number one source of finding patterns according to 89% of respondents and that percentage is consistent across all age groups. When they are searching on the Internet for project ideas, 70% said they go the yarn company web sites to find patterns. Magazines are another key resource for projects among 70% of respondents, followed by 62% who are inspired by free tear-off leaflets, and 51% from soft– or hard–cover books. Scarves continue to be knitters/crocheters favorite project. Seventy–seven percent said they made at least one scarf, 70% said they made a hat, 63% a baby blanket, 57% an afghans, and tied at 48% were ponchos and shawls, kitchen goods and other baby items. What Excites Them to Buy Yarn? What motivates this consumer to buy yarn? Across all age groups, knitters and crocheters alike said: seeing a yarn they like (74%), seeing a project they like (67%), and yarn on sale (63%). They shop at their primary retailer because the store has a good selection of yarn colors (63%), carries the brands they like (57%), has enough yarn in stock (47%), the yarn department is well organized (44%) and the store has the best prices (43%). More Projects Completed and Planned! In 2010 survey respondents said they planned to make more projects and they did! The mean number of projects made per knitter/crocheters increased from 26.6 in 2010 to 33.4 in 2011. CYC attributed this increase in part to the popularity of small, quicker projects such as scarves, hats and kitchen goods. And what’s ahead? Seventy percent of knitters and crocheters of all ages say they are planning to make more projects in 2012 and 28% said they are going to make the same number. They are planning more scarves (69%), hats (68%), afghans (53%), baby blankets (51%), shawls and wraps (48%), sweaters and vests (41%), mittens and gloves (41%), kitchen goods (41%), socks (39%), and other baby items (39%). Knitters/crocheters continue to be passionate about their craft. They simply enjoy the creativity and gain great satisfaction from making gifts and teaching others. They are in stores frequently to buy yarn and an amazing 98% plan to make as many or more projects in 2012 as they did in 2011. The members of the Craft Yarn Council, the industry’s leading yarn, publishing, and accessory companies, are committed to continuing to inspire these enthusiasts with innovative products and fashion forward designs both in print and on the web, along with programs to reach and educate new consumers to the fun and beauty of knitting, crocheting and crafting with yarn. Gastonia, NC—In an online survey of 5,000+ knitters and crocheters conducted in the fall of 2010, an amazing 80% of respondents said they taught at least one person to knit or crochet last year, and many taught more, which in part accounts for the amazing growth of these crafts. These enthusiasts love what they do and share that love by teaching others. This was the second online study conducted by Research Incorporated of Atlanta, GA for the Craft Yarn Council (CYC), the industry’s trade association. Research Incorporated has been gathering intelligence on yarn trends for the Council since 1994. Many of the questions that were asked in previous surveys were included to establish a trend line. However, for this research, CYC added many new questions contributed by retailers. The sheer volume of respondents substantiates trends in consumers’ perception of these crafts and their motivation to purchase yarn. All regions of the country were represented and the data is projectable to all online knitters and crocheters. Interestingly, throughout the survey, there were very few differences between knitters’ and crocheters’ responses. 65% said they do both knit and crochet; 21% said they crochet only, and 14% knit only. What motivated the majority to pick up needles and hooks in the first place? Creativity is the one most important reason that influenced them. Once they learn, knitters/crocheters find them to be great stress relievers and great for making gifts. They are always looking for patterns and inspiration and the vast majority (93%), turn to the Internet to find patterns and get new project ideas (84%), which is unchanged from 2009. When searching for project ideas, yarn company web sites are the most popular (71%), followed by social networking sites (52%), pattern publishers’ sites (44%), magazine sites (33%), and retailers’ sites (30%). Younger consumers, 18-24 years old, are more likely to use the Internet to seek advice and to watch knit/crochet videos. Online users still depend on a variety of print media for project inspiration. After the Internet, most use knit and crochet magazines (74%) as a source of project ideas, followed by inspiration from free tear-off sheets (59%) and soft and hard cover books (55%). Additionally, 60% subscribe to at least one e-newsletter. Seeing a yarn they like is the biggest motivator to buy among 70% of knitters/crocheters, an 80% increase from 2009. That’s why yarn departments are such an important factor in deciding where to shop in general. Most knitters/crocheters (73%) agree: "I visit stores just because they have a yarn department." Other motivators to buy are yarn on sale (66%) and seeing a project they want to make (62%). Half (50%) of respondents buy yarn at least once a month, and most reported that October was the most popular month for buying yarn (53%), followed by November (48%), September (45%), and January (41%). Smaller projects—scarves and hats/gloves--continue to be the most popular projects made by 78% and 68% of respondents respectively, slightly up from last year. These are followed closely by baby (64%) and adult afghans (58%), shawls, ponchos and wraps (54%), and sweaters and vests (46%). In addition, 48% made at least one charity project in 2010. When asked their reasons for selecting a primary retailer, they cited a good selection of yarn colors (64%) as the most important; followed by preferred brands (56%), carry enough yarn in stock (47%), and best prices (42%). What are they planning for 2011? Seven in ten (70%) knitters/crocheters surveyed report they will make more projects in 2011 and 28% say they will make the same number. These percentages are the same for knitters or crocheters. Knitters/crocheters continue to be passionate about their craft. They simply enjoy the creativity and gain great satisfaction from making gifts and teaching others. They are in stores frequently to buy yarn and an amazing 98% plan to make as many or more projects in 2011 as they did in 2010. The members of the Craft Yarn Council are committed to continuing to inspire these enthusiasts with innovative products and fashion forward designs both in print and on the web, along with programs to reach and educate new consumers to the fun and beauty of knitting, crocheting and crafting with yarn. Gastonia, NC— It’s enjoyable! That’s the number one reason that knitters and crocheters (59%) participate in these crafts, according to an online survey conducted in late 2009 by the Craft Yarn Council of America (CYCA). They also enjoy making gifts (47%). In addition, knitting and crochet remain great stress relievers and creative outlets according to 42% and 41% of respondents, respectively. A record number of 5,045 knitters and crocheters across the country participated in the survey. Respondents were recruited from a FaceBook ad and from invitations posted on the home pages of leading yarn manufacturers and CYCA’s home page. The sheer volume of respondents substantiates trends in consumers’ perception of these crafts and their motivation to purchase yarn and results in a sample error of +/- 1%. All regions of the country were represented and the data is projectable to all online knitters and crocheters. And 66% of respondents said they both knit and crochet, while 22% said they crochet only and 13% said they knit only. Following are more highlights. One of the reasons the number of knitters and crocheters has increased exponentially is that an amazing 76% of respondents reported they taught at least one person to knit or crochet in 2009. This enthusiasm and passion to teach others is shared by knitters and crocheters of all ages. As the survey response proves, knitters and crocheters are active on the Internet. The most common uses of the Internet for knitting/crocheting are to find patterns (93%) and get new project ideas (83%). These percentages are fairly consistent across all ages, regardless of whether the respondent knits or crochets. Their favorite sites are those offering free patterns, are easy to navigate and provide patterns for all experience levels. Additionally, 68% of the respondents use yarn company web sites and 40% use retailer web sites for project ideas. Sixty–seven percent of respondents use social media, including FaceBook (67%), Ravelry(38%), YouTube (29%),Twitter (16%), and MySpace (14%). While they may be online users, they also depend on a variety of print media for project inspiration. Seventy–six percent use knit and crochet magazines as a source of project ideas, 67% say they draw inspiration from free tear-off sheets and 50% get project ideas from large pattern books, small–format booklets and hardcover books. Two Projects a Month…Plus Charity Items! 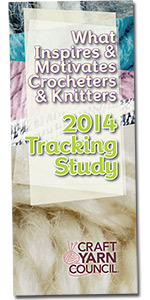 Crocheters and knitters made an average of 24 projects in 2009, compared to 21 projects in CYCA’s 2007 survey. According to 76% of respondents, scarves are their favorite project. Baby blankets came in second with 64%; hats and gloves at 63%; afghans and throws with 60%; shawls/ponchos/wraps at 52%, followed closely by other baby items, sweaters and vests. The fact that consumers reported they made multiples of a project--at least seven hats, six baby items, six scarves and six sweaters and vests—accounts for the increase in project volume. Scarves and hats/gloves are most popular among knitters/crocheters age 18-24. Baby blankets and afghans are most popular with the 45-54 age group. Crocheters tend to make more baby blankets and afghans, while knitters make more sweaters and vests. On average, 48% made at least one charity project in 2009. While respondents 65+ made the most charity items (65%), 31% of knitters/crocheters 34 and under reported making at least one charity project in 2009. Fifty–one percent of respondents buy yarn at least once a month. This trend is consistent across all age groups, with the exception of the 18-24 year olds who purchase yarn less frequently. Consumers are motivated to purchase yarn when they see a yarn they like (58%) and a project they want to make (54%). Yarn on sale as a motivator comes in third at 45%. When asked to rate the attributes most important to them when shopping for yarn, good color selection ranked number one with 85% of knitters/crocheters rating it a top priority; enough yarn in stock came in second (80%), best prices ranked third (73%), followed by preferred brands (69%). When asked their reasons for selecting their primary yarn retailer, the top five reasons were good selection of colors (58%), yarn brands I prefer (46%), convenient location (43%), best prices (42%), and enough yarn in stock (39%). Seven in ten (71%) knitters/crocheters surveyed report they will make more projects in 2010 and 27% say they will make the same number. These percentages are the same for knitters or crocheters. Interestingly, it’s the 18–24 year old group that says they plan more projects (75%)! And they plan more of their favorite things: scarves (65%), hats and gloves (64%), blankets and afghans (53%), shawls and ponchos (49%) and sweaters and vests (44%). Knitters/crocheters continue to be passionate about their craft. They simply enjoy it and gain great creative satisfaction from making gifts and teaching others. They are in stores frequently to buy yarn and an amazing 98% plan to make as many or more projects in 2009. The members of the Craft Yarn Council of America are committed to continuing to inspire these enthusiasts with innovative products and designs both in print and on the web, along with programs to reach and educate new consumers to the fun and beauty of knitting, crocheting and crafting with yarn. 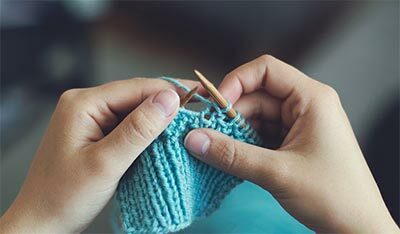 Gastonia, NC — Ask knitters and crocheters why they enjoy these crafts and you hear a variety of answers—for the sheer enjoyment, it’s a stress reliever, for gift giving or creativity—but they agree on one thing: they are making more projects than ever before. Research conducted at the end of 2007 for the Craft Yarn Council of America (CYCA) revealed that crocheters and knitters made an average of 21.2 projects in 2007, up from 17.3 projects in 2005, which results in an average of 7.4 yarn purchases a year. Scarves "tied" with afghans as knitters’ and crocheters’ favorite projects, with 52% saying they made at least one of each. Coming in a close third were baby blankets, with 48% of respondents reporting they made at least one. Hat and glove projects were up 56%; shawls and ponchos up 43%, and holiday projects up 75%. "Scarves continue to be a favorite entry-level project, and appropriately so," comments CYCA Executive Director Mary Colucci, "but we are also seeing increases in the number of knitters and crocheters making sweaters and vests. There was a 40% increase in the number of these items made in ’07 compared to 2005." CYCA commissioned Research Incorporated of Atlanta, GA, to conduct its eighth study to reveal current and projected consumer activity. Interviews were completed in October and November of 2007, and the survey questions closely paralleled those asked in the previous study, though several new questions were added. In-depth telephone interviews were conducted with 400 active knitters/crocheters who purchased yarn AND knitted or crocheted a project during the past year. Random calls, supplemented with a list of consumers interested in needlecraft from Experian’s nationwide BehaviorBank database ensured that data collected in this research is projectable nationally. Project ideas come from a variety of sources, but knitters’ and crocheters’ top choice in 2007 (with 47%) was magazines. This represents a 34% increase from 2005. Coming in second with 40% were friends and family. Small/large format pattern books followed with 31%. Projects are the key motivation for purchasing yarn according to 68% of respondents. On knitters’ and crocheters’ wish lists: Stock project resources near the yarn! While the Internet did not rank in the top three as a source for project ideas, of those who use the Internet, 18% use it to find patterns or (17%) use it to get new project ideas. "We know the influence of the Internet is growing, especially among younger knitters and crocheters," says Colucci. "Four in ten knitters/crocheters say they would be likely to access free online help from knit/crochet experts if available, while 65% of younger consumers less than 35 years of age claim they are likely to access free online help." CYCA’s tracking research, which was initiated in 1994, has documented knitters’ and crocheters’ passion for their crafts, and their enthusiasm is continuing strong in 2008. Eighty-eight percent (88%) of crocheters and knitters interviewed reported they would make at least as many projects in 2008 as they did in 2007; 39% plan to make more projects in 2008. All ages plan more projects, and women less than 45 years of age are more likely than older women to say they will make more projects. "These enthusiasts love to share their talents and time to help others," points out Colucci. "One-third made a project for charity last year and they told us what they’d like to see more of. For instance, they like gathering together with other knitters and crocheters to share ideas and network. Sixty-five percent of respondents surveyed were very or somewhat interested in attending free yarn events. CYCA is working on programs such as its popular Knit-Out & Crochet events to provide a meeting place for these devotees. Twenty-one percent also told us that easier patterns would inspire them to do more projects, and this is an area that CYCA’s Standards & Guidelines Committee is now addressing," concludes Colucci. Gastonia, NC — The latest numbers from Craft Yarn Council of America’s (CYCA) 2005 Consumer Tracking Study show that knitting and crochet project numbers were up 13% last year, and the biggest increases in activity were in the under-35, 55-64 and 65 and older age groups. Spurred by the dramatic increase in activity in 2005, CYCA decided to break its traditional bi-annual study schedule to get a more current look on activity and preferences. "What we found was a rapidly growing younger group of consumers, and dramatic increases in the purchase of fashion yarns," says John Laurie, chairman of CYCA. "Coupled with the projected increase in number of projects, this all indicates a continuation of the growth with new, younger consumers who will be with us for many years to come." CYCA commissioned Research Incorporated of Atlanta, GA, to conduct its seventh study to reveal current and projected consumer activity. Interviews were completed in October and November of 2005, and the survey questions closely paralleled those asked in 1994, 1996, 1998, 2000, 2002, and 2004. In-depth telephone interviews were conducted with 400 active knitters/crocheters who purchased yarn AND knitted or crocheted a project during the past year. Random calls, supplemented with a list of consumers interested in needlecraft from Experian’s nationwide BehaviorBank database ensured that data collected in this research is projectable nationally. "Our goal was again to describe yarn usage and shopping patterns, identify the most popular projects and expenditures, track changes in basic and fashion yarn usage, and provide information on future plans," says Mary Colucci, CYCA’s Executive Director. "Most important, the results always show us the important opportunities for both retailers and suppliers." Reflecting hot trends in fashion and home dec, scarves and afghans were among the most popular projects. This latest survey showed increases in the number of projects in every project category, an average of 17.3 projects, versus 2004’s 15.3, with afghans, blankets and throws remaining the favorite project among all crocheters and knitters (55% made at least one). Baby blankets and scarves were made by 50% of respondents. This last figure marks a 14 percentage point increase in the number of scarves made in 2005. This trend fueled a huge increase in sales of fashion yarns (defined as yarn with interesting textures, such as fur looks, metallics, chenilles and boucles), as 42% purchased fashion yarns in 2005, compared to 27% in 2004; a 56% increase. These increases were across all age groups, although knitters tended to purchase more fashion yarns than crocheters. Most respondents spent between $2 and $7 per skein, mirroring the 2004 results. However, while only 11% or respondents purchased yarns between $7–$9.99 in 2004, this number increased to 14% in 2005. Knitters and crocheters spent the most money on afghans and throws in 2005 ($36.07 average), followed by sweaters and vests ($34.77), ponchos ($26.61), shawls ($22.28), baby blankets ($20.42) and scarves ($16.85). Indicative of the continuing excitement, 80% of crocheters and knitters interviewed were planning to make as many or more projects. This response was unanimous across all age groups. "The research shows women are spending more money on knit and crochet projects, and doing more of them, but the challenge is to keep our customers returning for more to maintain this level of participation and enthusiasm," comments John Laurie. "There are three significant opportunities for our retailers: offering classes (since only 17% of respondents are very satisfied in that area), having knowledgeable employees (only 27% are very satisfied), and stocking up-to-date patterns (54% are very satisfied)." The changing sophistication of the craft yarn consumer is reflected in the types of classes they’d like to see. While 23% are looking for basic knitting and crochet classes, 28% want a general, less-structured clinic, and 29% were interested in advanced techniques. "Armed with this information, the industry can move forward with even more innovative programs in the future," says Mary Colucci. "We’ve already got a craft that offers stress relief, creativity, beautiful materials and a social atmosphere. We nurture that community through CYCA’s web sites and message boards, and will continue to introduce programs such as ’Progressions’ to stimulate excitement at retail. We all know that working together is the key to taking this industry to even higher levels of success." A summary of CYCA’s 2004 consumer research follows. Gastonia, NC — Young women ages 25–34 are the secret spark that’s fueling knitting and crochet yarn sales across the country, according to research commissioned in Fall, 2004, by Craft Yarn Council of America (CYCA). Since 2002, participation in these crafts increased more than 150% in the 25–34 age category, jumping from 13% to 33% and representing 6.5 million. The 18-years-and-under age group increased 100%, growing from 8% to 16% or 5.7 million women. Women ages 55–64, followed by a 74% increase in participation, or 7.8 million. Overall, 36% of American women—53 million-know how to knit or crochet, a 51% increase over the past ten years. Coincidentally, 13% of those surveyed can do both crafts. The Craft Yarn Council’s own programs may be a secret weapon in the growth of this lifestyle trend, as its marketing and promotion efforts have produced a steady stream of editorials on knitting and crochet, and a strong Internet presence in the form of message boards, free instructions and helpful hints. Up-to-date patterns are of major importance to respondents, as only 47% said they were "very satisfied" with up-to-date patterns available at their primary yarn retailer. More than 25% said they purchased "fashion yarn" in 2004 (defined as yarn with interesting textures, such as fur looks, metallics, chenille and boucle). The majority of knitters and crocheters, 37%, spend between $4–$7 per skein/ball of yarn, followed closely by 35% who spend between $2–$4 per skein/ball. 11% spend $7–$10 per skein/ball, and another 11% spend $10 and up per skein/ball. CYCA’s Chairman, Richard Brown, confirms that, "The investment that has been made in new yarns, new magazines and new patterns by our members is phenomenal, but it has paid off." Throws and afghans continue to be the favorite projects of both knitters and crocheters, with 53% reporting they made at least one in 2004, followed by baby blankets at 42%, and scarves at 35%. The top expenditures, however, were for shawl and poncho projects, which averaged $36, an increase of more than 60% from 2002, followed by throws/afghans at $32.40, and sweaters and vests at $31.30. All project expenditures, except those for bazaar items, increased since 2002. These customers make an average of 2.8 visits to their primary yarn retailer per project, and buy other items when they’re in the store as well. What research has shown over time is that knitters and crocheters are passionate about their crafts and grow more so with age. "It’s not a fad," says Richard Brown, "it’s an evolution, a lifestyle phenomenon. And we at CYCA are committed to encouraging and developing this burgeoning craft network of devoted enthusiasts." Gastonia, NC — "It’s been a phenomenal, record-breaking year for yarn sales," relates Richard Brown, Chairman of the Craft Yarn Council of America (CYCA), the yarn industry’s trade association. "By applying research, pursuing more ways to educate consumers, and using common sense, we can predict sales continuing strong for years and years." Brown credits the focus and commitment of CYCA’s members to fund an expansive promotion campaign and then backing it up with exciting yarn, patterns, publications and accessories, for the boon. But, he’s quick to point out, "This was not an overnight occurrence. It was really an evolution-- a gradual process that we started in 1998." More people know how to crochet and knit than ever before. Fifty-three million or 1-in-3 women know how, and there are 94 million more potential consumers. 85% of current crocheters and knitters plan to make as many or more projects in 2005. More younger women are crocheting and knitting than ever before and we know from previous research, passion for these crafts will grow with age. 52% of the under-35 age group said they were going to make more projects in 2005. We are just beginning to see the impact of fashion yarns on our marketplace. There are 42% of consumers who do not know about these yarns." What the numbers do not track is the evolution of these crafts from hot, fashionable hobbies to cultural phenomena. "There’s a social aspect which is driving this trend," continues Brown. "More and more people want to be a part of the communities of knitters and crocheters and that’s true for adults as well as children." He also points to the growth of the industry charity, the Warm Up America! Foundation, as another indicator of this trend. "Warm Up America! has galvanized hundreds of thousands of crocheters and knitters to use their crafting talents to help others. CYCA is proud to be associated with this nonprofit," says Brown. New York, NY — Plans are underway to make Knit-Out & Crochet 2005, scheduled for Sunday, October 2nd, even bigger and more fun than the 2004 event, which attracted more than 30,000 people to New York’s Union Square Park. Richard Brown, Chairman of the Craft Yarn Council of America (CYCA), the yarn industry’s trade association and Knit-Out sponsor, commented, "Every year since 1998, we have expanded our Knit-Out program because people return to learn new crochet and knitting techniques and to see the latest fashions. This year’s program will be rich in education, fashion and fun components." While the FREE, one-on-one knit and crochet lessons will continue to be the cornerstone of the fair, new this year will be the Crochet & Knitting Olympics, a series of yarn-related competitions to spark the competitive juices in all ages. There will be a new design contest, following up on last year’s successful first-ever scarf contest. Back by popular demand are the demos, Beyond the Basics technique lessons, fashion shows for people and dogs and Show & Share segments. The New York event is just one of dozens of Knit-Out & Crochet events held around the country. The fifth Washington, DC, Knit-Out is scheduled for October 23rd, and others will be posted at the CYCA’s web site: www.knit-out.com as the information becomes available. Got Questions? Get Help! Go to…. Gastonia, NC — How can I make my edges look straighter? What’s the best way to start a new color yarn? Do you have a complete list of abbreviations? These are among the most frequently asked questions at the Craft Yarn Council of America’s (CYCA) bulletin boards, and just three of the many questions answered at the Council’s new web sites: www.Knit911.com and www.Crochet911.com . "As millions of new knitters and crocheters advance to more complex projects, we want to provide them with problem-solving tips and helpful information," explains CYCA’s Executive Director Mary Colucci. "We received input from CYCA members, talked to numerous teachers, plus regularly monitored the Council’s bulletin boards to develop this web site. It’s rich with FAQs, facts, and tips, and we plan to add content to it on a regular basis. The Internet is a wonderful medium to reach consumers and research shows more and more crocheters and knitters are turning to the Internet to find answers to their problems." In 2003, CYCA introduced its first shelf talker: www.learntocrochet.com/www.learntoknit.com, targeted at beginners, which now is used widely throughout the industry. "The new space-saving retail shelf talker," says Colucci, "is targeted at the crocheter or knitter who has progressed beyond a first project." The new web site also will provide links to the learntoknit.com/learntocrochet.com site, as well as the CYCA regular web site: www.knitandcrochet.com. The colorful shelf talker is two-sided, showing the www.Knit911.com web site address on one side and the www.Crochet911.com web site on the other. Retailers can order quantities through their CYCA yarn resources or by contacting Council offices. Gastonia, NC - Warm Up America!, the national charity program that has provided hundreds of thousands of hand knitted and crocheted afghans to people in need, recently announced the appointment of three new members to its Board of Directors: celebrated ready-to-wear designer and television personality Isaac Mizrahi, noted pediatrician and writer Dr, Perri Klass, and Dr. Joyce Brown, president of the Fashion Institute of Technology. They join Jane Chesnutt, Editor-in-Chief of Woman’s Day Magazine, and Debbie Macomber, best-selling women’s fiction writer. "We are delighted to welcome Mr. Mizrahi, Dr. Klass and Dr. Brown to Warm Up America!," says David Blumenthal, president of the Warm Up America! Foundation. "Mr. Mizrahi’s design inspiration and positive comments about knitting will be invaluable to helping spread the word about the program. Dr. Klass’s expertise, coupled with Dr. Brown’s knowledge of educational channels, will be instrumental in guiding the Foundation’s efforts to bring the program to schools around the country," explains Blumenthal. Knitters and crocheters across the country came together twelve years ago when Warm Up America! asked them to stitch afghans for the homeless, and their numbers have been growing ever since. This national charity program, started in Wausau, WI, in the early 1990’s by Evie Rosen, now provides hundreds of thousands of hand knitted and crocheted afghans to people in need. The Foundation’s goal is to motivate, train and coordinate volunteers to knit and crochet afghans and clothing for people in need. It’s a wonderful program for groups to adopt, no matter what their age. ‘Each One Teach Two’ Doubles the Fun! Gastonia, NC — The yarn industry has a secret weapon. It’s the millions of passionate crocheters and knitters, 53 million to be exact, who love to share their craft. The new "Each One Teach Two" program appeals to crochet enthusiasts. "The idea evolved from our Crochet Committee strategic initiatives," explains Craft Yarn Council of America’s Executive Director Mary Colucci. "Research shows that people usually learn to crochet or knit from friends or family. That’s when the committee came up with the idea of mobilizing current crocheters to help us teach others and the idea for the www.eachoneteachtwo.com web site was born." With the guidance of industry crochet guru Jean Leinhauser, who prepared the content, the web site contains everything anyone interested in sharing her or his love of crochet would need. For instance, there are helpful teaching hints, diagrams which can be downloaded, and even an easy first scarf project. "We stress that you do not have to be an expert crocheter to teach the basics," continues Colucci, "Whether you’ve been crocheting for two weeks or 20 years, you can be a part of our ’Each One Teach Two’ campaign." As an extra incentive, participants who have taught at least one person to crochet can sign up for the Teacher’s Award Program. Every month their name is added to a drawing for a basket of yarn. Hundreds of "teachers" have already signed up and activity at the web site is growing. The Council plans to expand the program to knitters. New York — The Craft Yarn Council of America (CYCA), the yarn industry’s trade association, recently announced that beginning in February, 2003, its Certified Instructors Program (CIP) will be offered in association with the Center for Professional Studies at the Fashion Institute of Technology’s (FIT). As part of this training course of study, students who successfully complete the program will earn continuing education units (CEUs) for the first time. "We are pleased to be associated with FIT," says Mary Colucci, CYCA’s Executive Director. "The college’s reputation for training professionals in the marketplace and providing ongoing training to advance careers and businesses is respected nationwide. FIT is also affiliated with the State University of New York. The Center for Professional Studies is a unit of FIT’s School of Continuing and Professional Studies. "Our goal with the CIP program," continues Colucci, "has been to train knitting and crochet teachers and to raise these studies to a more professional level. Now students who are able to take the courses through FIT will obtain nationally recognized validation of their training at an internationally respected institution. We are pleased that Arnetta Kenney, an adjunct professor in FIT’s Textile Surface Design Department and a CIP teacher who helped to forge this new affiliation, will teach the first courses." Joan Volpe, Managing Coordinator for The Center for Professional Studies, commented, "We have seen a resurgence in quality hand crafted item demand, coupled with a renewed interest in obtaining high level artisan skills. The Craft Yarn Council’s program insures quality instructor training and through our partnership, people who wish to learn knitting and crochet will have the benefit of knowing that their instructor has nationally recognized credentials." Since the Council created its CIP program in 1981, it has trained thousands of teachers around the country. The program includes technique and teacher training in both knitting and crochet. Both courses require 17 hours of class work, the completion of projects and student teaching. More details about the program can be obtained from the Council’s web sites: www.teachknitting.com or by contacting Council offices.